The long-staying Yellow-browed Warbler in Cornwall Wildlife Trust’s Swanvale Nature Reserve at Swanpool on the edge of Falmouth didn’t appear today but several Chiffchaff were active in the early morning sun. 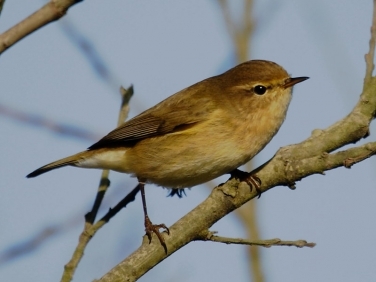 Insight into Chiffchaff (Phylloscopus collybita): a common warbler that migrates to most parts of the UK in the summer but is now overwintering in increasing numbers in the south. The easiest way to seperate it from the common migrant Willow Warbler is by its repetitive call ‘chiff-chaff’ from which it gets its name.